Sri City, August 30, 2018: – In recognition of its achievement of ‘GEM 5 level’ sustainability standards, which is the highest achievable rating level, Sri City was awarded the prestigious ‘GEM Sustainability Certification’, hosted by the Associated Chambers of Commerce and Industry of India (ASSOCHAM). In a colourful ceremony organised by ASSOCHAM for the formal launching of ‘GEM Sustainability Certification Programme’ held at Hotel Le-Meridien, New Delhi, on Wednesday evening, Mr. Satish Kamat, President (Operations) received the award on behalf of Sri City, from Prof. Ashutosh Sharma, Secretary, Department of Science & Technology, Government of India. Mr. Mr. Uday Kumar Varma, Secretary General, ASSOCHAM presented the certificate. Mr. Pankaj R. Dharkar, Chairman, CGEM and some of the senior officials of ASSOCHAM were present during the award presentation ceremony. In recognition of its world class infrastructure, pristine credibility, enormous customer following and high standards adopted to emerge as a leading business city Sri City has been winning the most admired accolades and honours from various national and international organisations, including the State & Central Governments. 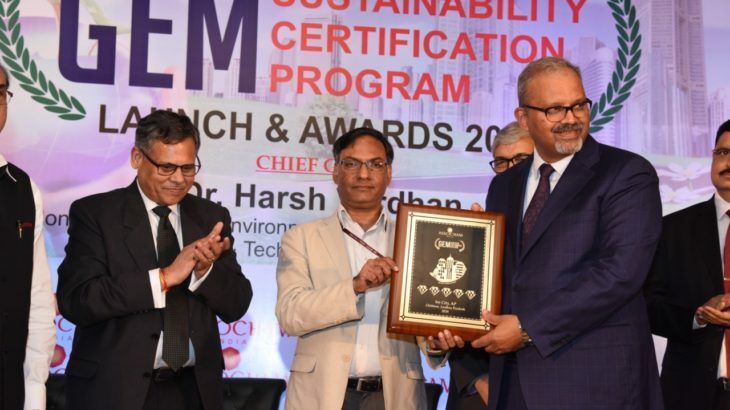 ASSOCHAM took up a Green Initiative to care for the Mother Earth and formed a Council for Green and Eco-friendly Movement (CGEM) that will govern the ‘GEM Sustainability Certification Rating’ programme. This programme aims to address the sustainability of a given development throughout its lifecycle from design through construction to operation. As a part of the initiative, ASSOCHAM awards the Sustainability Certification Rating to Housing, Urban Development, Residential, Commercial, Hotels, College, Universities, Schools and Factory buildings and developments. All existing, new and upcoming buildings can participate in this programme.